Chocolate and wine. Name a more iconic duo, I’ll wait. 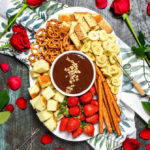 When it comes to heartthrob food pairings, dark chocolate and fruity red wine is the most sensual and simple combination that immediately comes to mind. Take a bite and then a sip, and it’s all bliss, baby. This is one Valentine’s Day cliché that I’ll happily indulge in any day of the year. But what if, instead of biting and sipping and savoring and repeating, we combined the two for maximum enjoyment? What if we put red wine into one of our most delectable chocolate desserts– and on top of it? 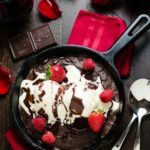 How about a decadent, fudgy, Skillet Red Wine Brownie, topped with vanilla ice cream and red wine hot fudge, served warm with two spoons and two glasses of the leftover wine for you and your sweetheart? Oh yes. 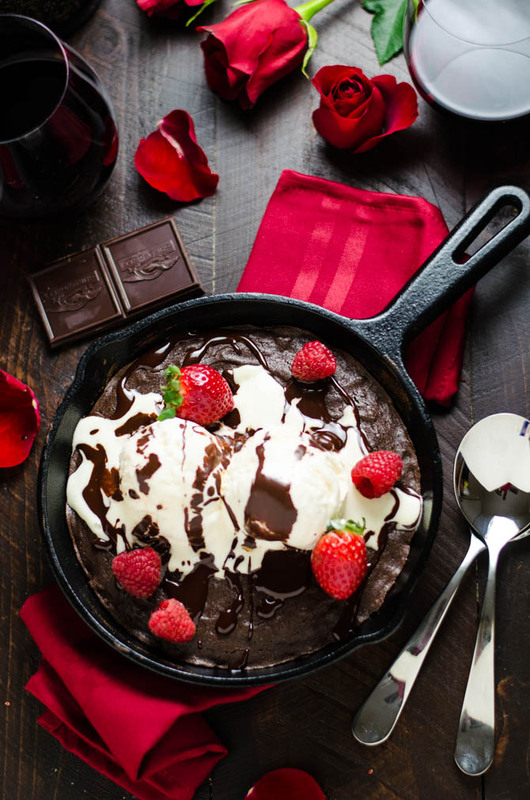 And if you happen to make this Skillet Red Wine Brownie all for yourself, I sure won’t judge you for the indulgence. You’ve gotta love and treat yourself! Or share it with a gal pal while you talk about why relationships are overrated and Valentine’s Day is the worst. Been there, too. To make the brownie, I simplified (and scaled down) my all-time favorite brownie recipe, aptly named “The Best One Bowl Brownies”. This time, I decided to mix 1/4 cup of Pinot Noir into the brownie batter to give the brownies that slight fruity flavor and amplify some of the wine-like notes in the dark chocolate. Did you know, by the way, that chocolate also has tannins, and that cocoa beans are fermented for chocolate-making? Wine and chocolate have so much in common; it’s so romantic. Pinot Noir might seem like a strange choice for brownies at first, as it’s not the most desserty of wines. However, I find that it’s just sweet enough to balance the dark chocolate well without overwhelming the brownies and becoming cloying. 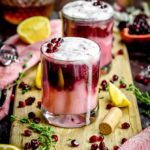 Make sure you pick a Pinot Noir that is more fruit-driven (usually with notes of strawberry or raspberry) rather than one that is earthy. But most importantly, pick a wine that you enjoy and would like to sip on as you eat your Skillet Red Wine Brownie! You might even want to buy two bottles. 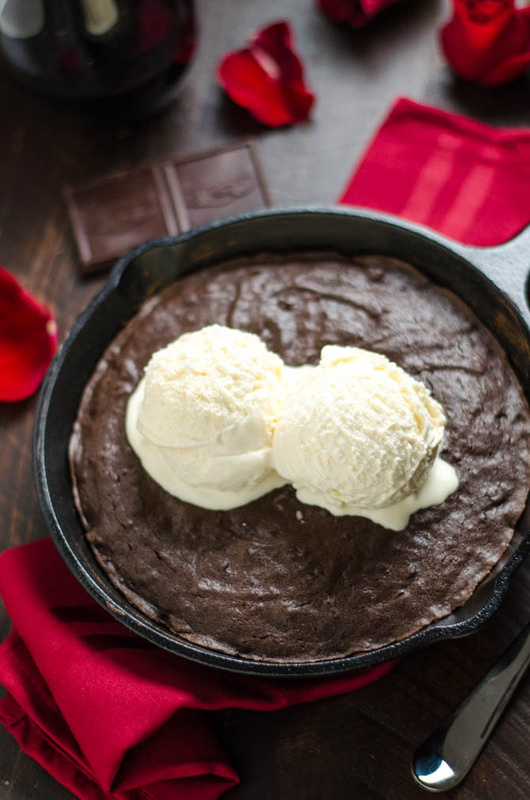 No skillet brownie is complete without a few scoops of vanilla ice cream on top, so I use the opportunity to bring even more chocolate and wine into the mix. As the brownie bakes, which only takes 20 minutes, I whip together a super fast red wine hot fudge for topping. No double-broiler necessary here, just a microwave safe bowl and, of course, a microwave. And then I drizzle it over top of the ice cream, scatter over some berries, and try to stop myself from eating the whole skillet to myself while it’s still warm. 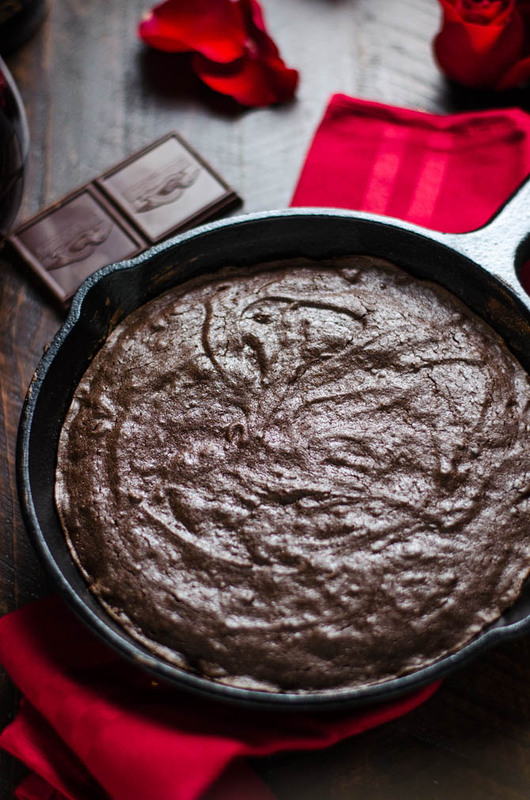 Speaking of which, you don’t have to serve this Skillet Red Wine Brownie right after making it if you don’t want to. 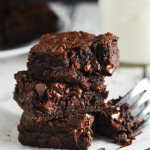 Feel free to bake the brownie ahead of time and prepare the hot fudge, and then just warm them up shortly before serving. No one will be the wiser! I’m salivating so much right now just remembering how delicious this was. Every time I look back at a picture or re-watch the video, my mouth can’t help but water. Oh yeah, how did I not mention the video yet? Check it out and if you like it, subscribe to the Host the Toast Youtube channel for more videos. I’m just getting started but I really think they help illustrate how to make the recipes so I’m going to keep rolling them out! And more importantly, if you like it, make the Skillet Red Wine Brownie of course! 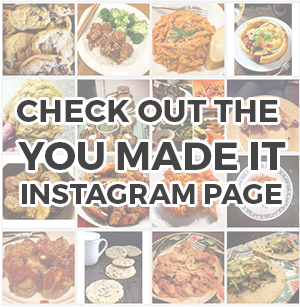 And when you do, don’t forget to take a picture and tag #hostthetoast on Instagram to show it off! Let me know in the caption what you think of the brownie– I just know you’re going to love it. In a large, microwave safe bowl, combine the chopped chocolate, unsalted butter, and 1/4 cup of red wine. Loosely cover and microwave for 30 seconds. Stir and continue to microwave and stir in 15 second intervals until the chocolate is completely melted and the mixture is smooth. While still hot, mix in the sugars and stir to dissolve. Allow the batter to cool for a couple of minutes, and then mix in the egg, egg yolk, and vanilla extract. Once well-combined, fold in the flour, cocoa powder, and salt, until no white streaks or clumps remain. Be careful not to overmix. Pour the brownie batter into an 8 inch cast iron skillet and smooth with the back of a spoon so that the batter is even. Bake until cooked through but still soft, about 18-20 minutes. While the brownie bakes, make the hot fudge. In a smaller microwave safe bowl, combine the heavy whipping cream, red wine, and dark chocolate. Loosely cover and microwave for 30 seconds. Stir and continue to microwave and stir in 15 second intervals until completely melted and smooth. While still hot, mix in the light brown sugar. Set aside. 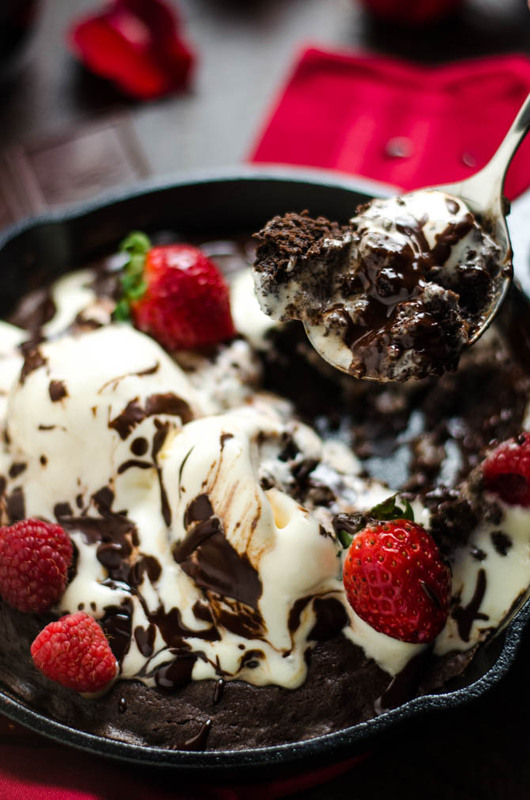 When the brownie is ready, top it with vanilla ice cream and berries and drizzle with the red wine hot fudge. Serve warm. Another awesome Valentine’s Day idea. 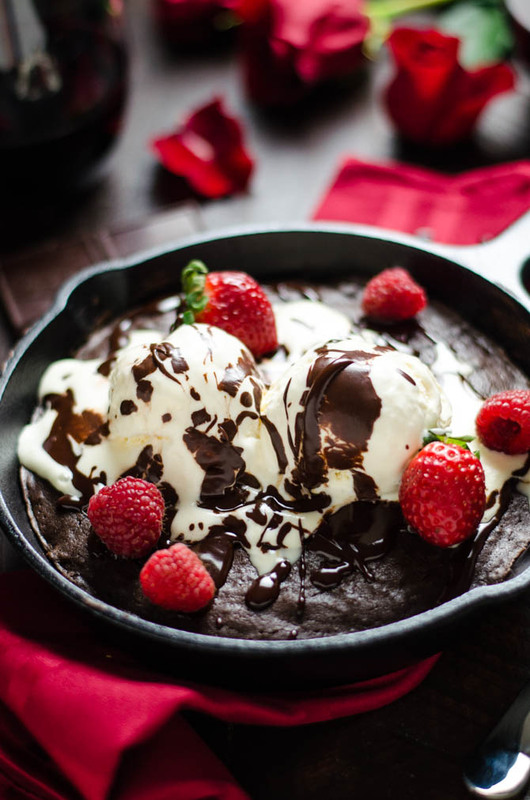 Skillet desserts are really popular these days at restaurants too, thanks for the at home recipe! 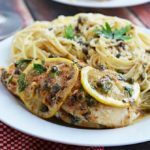 Hi, this looks great! will it freeze well?